Reverend Dr. William J. Barber II compares the rising tide of protest to what Dr. King called a “marvelous new militancy” in the 1960s. Raleigh, NC—Not many people would blame Karen Holliman if she stayed home in Durham and enjoyed an unseasonably beautiful Saturday. She didn’t. Holliman, along with her friend and neighbor Heidi Hannapel, joined an estimated 80,000 others and nearly 200 groups at the 11th annual Forward Together Moral March, led by North Carolina NAACP president Reverend Dr. William J. Barber II. And despite the political circumstances that surrounded the march—chiefly, the new Trump administration and a state legislature that still has two veto-proof Republican majorities—Barber is optimistic about the future. “I think we’re seeing the adolescent growing pains of a third Reconstruction,” he says. In 2016, North Carolina seemed to be the epicenter of mass protest in the United States. 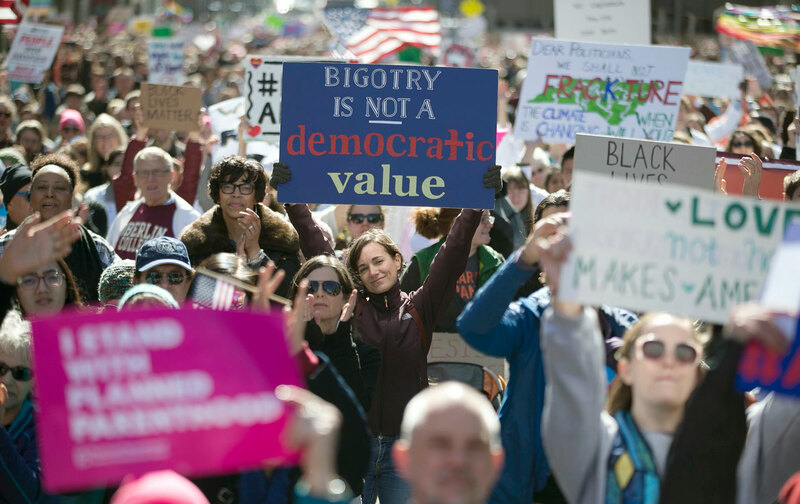 The passage of anti-LGBTQ and anti-worker House Bill 2—known by most Americans as the bathroom bill—in March sparked numerous protests throughout the year. Large demonstrations in protest of a special session in December aimed at curbing the power of the state’s new Democratic governor ended with over 50 people arrested. And outside of Raleigh, the Charlotte uprising in September brought to light community anger over the death of Keith Scott, who was, at that point, the sixth person killed by Charlotte-Mecklenburg police in 2016. This year, following the inauguration of President Donald Trump, the kind of protests frequently seen in North Carolina have been spreading across the nation. Up to 5 million people worldwide joined in the Women’s March in January, including 17,000 in Raleigh. Demonstrations at airports round the country following Trump’s Muslim ban included over a thousand people who converged on Raleigh-Durham International Airport and the arrest of six in Charlotte. And last weekend, thousands protested Trump’s immigration policies near the state legislative building. And fight back they did. Once the new government began taking an axe to civil rights, public education, and the safety net, the Moral Monday protests began. Nearly a thousand people were arrested that year in nonviolent demonstrations. The following year, the annual march drew over 80,000 people, the largest before Saturday. That battle will need people like Carreño and Holliman, as well as people like Barbara Seawright and Sylvia Steele. Both women live two hours away in heavily conservative Davie County. “It’s a Trump county, but we’re not Trump people,” Seawright laughs. She says she’s marching for equality and health care; Steele, who has non-Hodgkin lymphoma, says she’s demonstrating because black lives matter—“especially women,” she adds. Editor’s Note: A previous version of this article incorrectly stated that HB2 was passed in February of 2016. It passed in March of that year, and the piece has been updated.